Postponed Vote - What Happens Now? 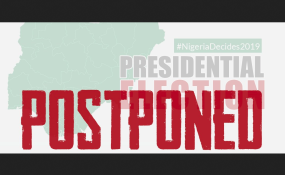 Nigeria Election Postponement - Who's to Blame? Nigeria's Election Delay - Why, and What Next? How Nigerians reacted to postponement of elections. As Nigerians get ready to head to the polls on Saturday, the Head of the UN Office for West Africa and the Sahel (UNOWAS), described the pre-election period as "largely, peaceful and participatory", and called for that spirit to prevail through election day and beyond. In a statement on Friday, Mohammed Ibn Chambas, who is also the Secretary-General's Special Representative for West Africa, encouraged all Nigerians to "continue to maintain calm and to exercise patience and restraint throughout the voting process and the announcement of the final results". As President Muhammadu Buhari aims to extend his time in office, after victory four years ago - when, for the first-time ever, an opposition candidate defeated a sitting president - former Vice President Atiku Abubakar has emerged as his main challenger, according to news reports. Mr. Chambas welcomed the candidates' signing on Wednesday of the second National Peace Accord, which aims to keep the vote peaceful and ensure a non-violent transfer of power, and urged them to "seek redress of any grievances they may have through legal and constitutional means". He pressed the candidates to "mobilize" their supporters to "adhere to the tenets of free, fair, transparent, inclusive and credible elections, devoid of hate and denigration of each other". "Firmly reject all undemocratic and negative voices that may seek to disrupt the elections and promote conflict between Nigerians", he said, while encouraging voters in Africa's most-populous democracy to exercise their civic responsibility and come out "in numbers" to peacefully cast their votes. The Special Representative said that success at the polls was "the responsibility of all Nigerians and relevant Nigerian institutions, particularly the Independent National Electoral Commission (INEC), security agencies, political parties, candidates, religious leaders, civil society". While calling on all participants to "prioritize the interest of the country", the UNOWAS head expressed his hopes that the continent's largest economy will successfully conduct free, fair and transparent elections that will "set an example for the elections coming up in West Africa and Africa, and underscore Nigeria's leadership in the region".